Join us for the 18th annual “Kidfest”! Heaven 98.3 “Tallahassee’s Gospel Station” invites you to join us at the Kids Incorporated of the Big Bend’s 18th Annual “KIDSFEST” happening on May 4th at Cascades Park! Kidsfest includes FREE activities for children of all ages, giveaways, entertainment, and so much more. There is no admission fee and event is completely FREE to the public! Chuy’s Tex Mex will be providing food and all food proceeds will be assisting Kids incorporated’s mission to serve the children and families in our community. Kids incorporated will also be collecting children’s books for the Big Bend’s “Tiny Library” project. Please feel free to bring a children’s book to donate. Visit Kids Incorporated of the Big Bend on Facebook, Instagram, Twitter or at kidsincorporated.org for event details and also to sign up as an sponsor, exhibitor or volunteer! 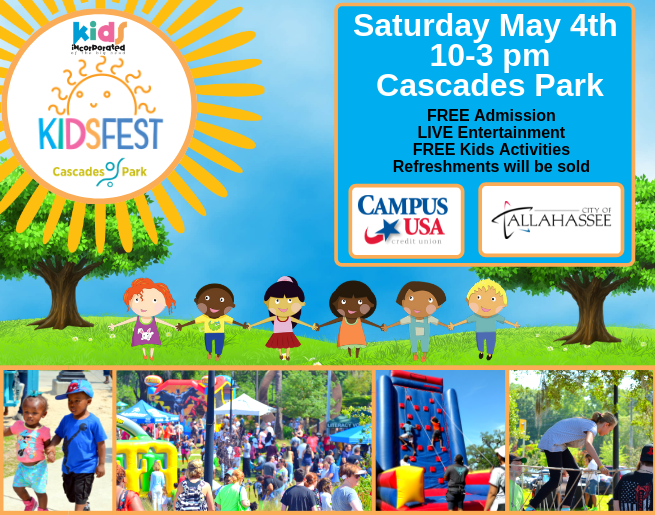 KIDSFEST IS MAY 4TH FROM 10AM – 3PM AT CASCADES PARK IN BEAUTIFUL DOWNTOWN TALLAHASSEE! WE CAN’T WAIT TO SEE YOU THERE! Brought to you by Kids Incorporated of the Big Bend, the City of Tallahassee and Campus USA!